I am strongly considering playing a Paladin when classic drops. Currently I am playing a Paladin on a private server (I am aware that private servers aren't 100% accurate) to try and get a feel for the class. I played one for a little bit back in Vanilla, but never got him beyond the 30s. So here are some questions for all the Paladins out there! How do you plan on leveling in Classic? Race choice? Spec? Zones you are excited to get into? Zones you plan on avoiding? Dungeons? Going to take it nice and slow, or are you going to push hard to 60? IF( and that is a big IF, but been playing around with the thought) i choose paladin. I wanna go Human, I dislike the weapon animations for Dwarfs. I plan on leveling as Retribution. ( Something like this https://classicdb.ch/?talent#sE0zZxhZVbetocqo ). When mainly buffing myself Blessing of Wisdom through the leveling phase. I plan on doing as many zones with undead and demons as possible, so i get to deal extra dmg on them! Retri should also be good enough to heal dungeons while leveling, if i bring water! I've been a Paladin since I started playing WoW, but returning to one for Classic is a really hard choice. If you've been spoiled by how better-designed the class was during WotLK, it's extremely hard to go back to 5-minute buffs, severe mana drain, constant seal casting, and in the case of Classic, the loss of Crusader Strike making ret very, very limited in terms of spells. I am not sure I would get much enjoyment out of constantly being OOM and feeling like there's so little dynamic to the class/spec like in later expansions. 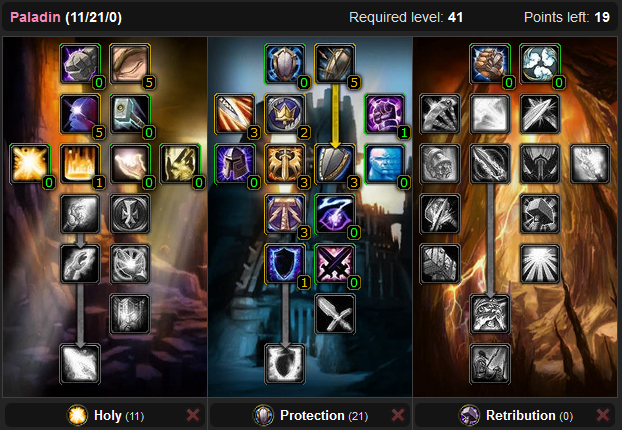 I feel that if I go Paladin, I will switch to holy at level cap and heal for raids and BGs. Am I wrong in thinking this? Really curious. I've been struggling with what else I want to play instead, and having played a Shaman on Nost, I've been thinking a Mage this time around for constant access to food, easy transportation, and easy farming + gold making. One auto-attack at a time. I've always found more enjoyment out of leveling a Paladin than any other class mainly due to class fantasy and OP potential they have early levels. First things first pick Human (unless you just really love dwarfs, no shame, they're cool but not as convenient as human). Human starting zone is OP. Elywnn, Westfall, Redridge and Duskwood clumped together is quite nice. Diplomacy is very handy long term, Sword/Mace spec is overpowered and perception is amazing in PvP. Your first 11 talents are going to go into Holy to get Concencration at 20. You can go either Prot/Ret spec after that. For me personally I enjoy prot leveling until 40ish. I usually always go mace/sword and board a lot of early leveling (1-35ish) and I enjoy tanking dungeons which is a quality of life improvement as everyone needs tanks. There is also a great quest reward 2 hander that is OP as hell if you get it early level 20's. If you snag that thing you can go seal of command spec and enjoy having fun with that. You can also heal in any spec comfortably until around 40ish...You're really a jack of all trades early levels and its extremely fun. Level First Aid ASAP. Don't spend downtime wasting mana on healing yourself. First aid is very cheap early levels. Make sure to constantly hound mages for food/water. (There will be a lot of them running around.) So you can drink/eat right after First aid is used if needed. Level engineering. If you have engi progressed as you level you will have a serious one up on majority of the content. Dynamite will help out tanking/increase DPS in dungeons. Stun grenades can help you get out of a jam or have a one up on enemy players. Usefull trinkets and life saving devices are plentiful with engineering. Skinning/Mining is a decent secondary gold making profession. Just some tips I quickly jotted down. If you want to talk seriously about paladins hit me up, it's my bread and butter. Awesome info Caspus! Very helpful. I'm still struggling with my class choice for classic. It is between Paladin, Warlock, or Druid. Leaning towards Druid atm. @caspus Hello, fellow paladin enthusiast here. I was wondering what your reasoning for going into holy and getting Concencration first is? I have personally never gone this route even though I have levled 4 paladins to 60 on private servers and several others to lvl 30s~. The talents you get in the holy tree just don't seem to be worth it imo. 10% STR is nothing in the early levels because your total STR is so low. Imp SoR is nice but 15% negligible. Concencration is very mana heavy and damage is low, only useful for tanking dungeons or if you are playing together with a friend. Myself I usually go 5/5 imp Dev aura and 3/3 precision first. You will be using dev aura almost exclusivly while leveling so in the long run you will gain a lot from it, and one of the most frustrating things is Missing your attacks, especially if using a slow 2h weapon. After that I continute in the ret tree. @Judgement, don't go Divine Strength/Improved SoR, go Divine Intellect/Spiritual Focus. Together, they hugely boost your durability and make you a better healer. Consecration may seem expensive but if you have three of four mobs pounding on you, you get huge value out of it. Go sword and board, throw up Retribution Aura and Blessing of Sanctuary, put a shield spike on and let mobs beat themselves to death while you keep up your health and mana with Seal of Wisdom and Seal of Light. @Timberfist Hey, yes I have played this prot spec in the later levels, but I was talking about the earlier levels, 10-30, at this level you don't have sanc or any kind of gear to support taking 3-4 mobs at the same time. My point of view is a bit skewed I suppose, since my main goal is always to level as fast as possible. If you want to take it slow and enjoy the full vanilla experience I can see this being a nice all-around spec, but for faster leveling it wont be. It all falls down to preference but generally you can start doing a lot of AOE pulls. I personally rely heavily on consumes and engineering when I level. Depending on wether I have a friend or not that's doing herablism/alchemy (i almost always will) im always chugging potions. (Defense, Strength, Agility, Fortitude, Troll's Blood, Mana/Health potions). I usually do Egineering/Mining as my profressions and ill have a friend thats a blacksmith. The early blacksmithing gear is useful, the Sharpening stones/Weightstones are very nice. I don't buy any gear except a main hand upgrade and shield depending on how bad mine is. I have a bank alt immediately with enchanting so I can disenchant items I mail to him asap. I don't waste too much time on the AH, prices are super cheap and not worth the time spent selling/flipping. Better to disenchant and hoard mats asap and slap enchants on any big upgrades that fall in your lap. I also tank dungeons, a lot. I find its the easiest way to get better gear aswell as there really isn't any "Tank" gear its just dps gear you call tank gear early on. Tanking early dungeons like Deadmines/Wailing Caverns, SFK, BFD, Stockades, etc. with concencration is perhaps the easiest faceroll in all of WoW. Hound mages for water and food any moment you get. If you find one mage willing to give you a stack of water say TY and go to the next mage next to him and ask him for a stack. I have my water binded and I drink the milisecond I get out of combat. Make that a habit and life will be great. This is usually what I end up with at level 40's. I spec more for tanking dungeons as I typically play with a lot of people. We usually level by ourselves but do dungeons together frequently so I have to keep up with that. I would say around 45-50 is when you want to actually start playing your end game spec. Thats when i'd respec to holy/ret etc. Prot is a great tree for leveling up to that point but starts to slow down solo a bit (Still faster than holy). In group play it is still great as you can do mass AOE easily and still hop into any dungeon and faceroll it. @Caspus hope you don't mind the random questions, but I've been on the fence about going back to Paladin for classic finally changing it up. I've actually never played prot in my 12-13 years of WoW. How is it in vanilla for leveling? It's that or ret, and with ret being so limited in form, and me being so familiar with WotLK and TBC version of Paladin, I would maybe find the spec super lackluster and disappointing. How does prot compare in terms of speed, efficiency, etc.? 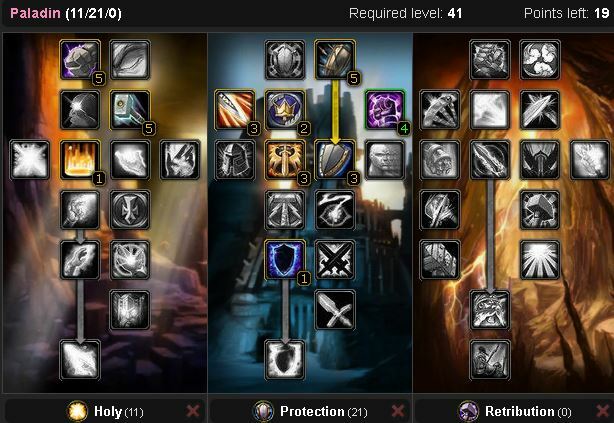 If I played Paladin I think I'd consider going Holy so I can easily be included in most raids and fit into BGs pretty well without needing to respec. How enjoyable is Holy? Is it still basically one button like it was in TBC? I enjoy prot leveling purely on the simple fact that that I can survive most things. It's not the fastest way to level, its a decent steady pace as you do a lot of reflect and AOE damage so you can pull more than one mob at once where as ret is usually 1-2 mobs at most generally at the same time. For example if you're prot specced and decently geared by level 53-55 you can pull 5-10 mobs at once in Western Plague lands at once and AOE grind there like a mage would. Early level 1-Mid 30's I highly recommend prot leveling. Yes you can do more damage as ret but you will take more damage and if you don't plan properly you will be blowing CD's and wasting mana left and right. You will have more out of combat time if not played properly. Prot is decent damage early on and your mitigation is substantially higher thus you do not worry too much about overpulling. I played a paladin in vanilla, I can assure you I won’t be making the same mistake again. To add detail to this, I had engineering, played Ret, did a lot of PvP and a moderate amount of PvE but it’s just freaking boring. Yeah we got hammer later on which helped quite a bit but just overall the fighting was based on auto attacks and managing cooldowns effectively to best utilise the toolkit. It’s boring, and you will be respeccing to heal in a cloth robe in MC constantly and then grinding bandages and engineering mats just to PvP. All about perspective. Paladin is a lore heavy class and if you enjoy the class fantasy of it you will have a lot of fun. Majority of vanilla is very simple rotations and can get really boring. Just find what's right for you. I haven’t been playing a paladin in vanilla, my main was a warrior. Now i pretty sure that when the Classic come out I choose a paladin. I really like the idea of being supreme support and be able to help each class somehow or other. Knowing nothing about this class i started to get into the whole paladin thing and I found myself totally confused with all this blessing, auras, seal and after that a bunch of other spells. So i come up with idea of some spell notes that will help me to overview all the abilities that paladin has. There are 3 pages: Blessings, Seals&Auras and Spells. It’s set up for printing (A3 format and 300 dpi will provide good quality) I wanna share it with you guys. Hope it might be helpful for young paladins as I am. All the abilities were picked in the highest ranks. Depends on the sit reck nerf, but I will still stay in prot to handle a few mobs in case of miss-pull. I suggest sticking to prot, or at least a sword and board. It will be tediously boring so have a tv show going on another monitor or something. I played Ret back then and i will be playing Ret when Classic come.